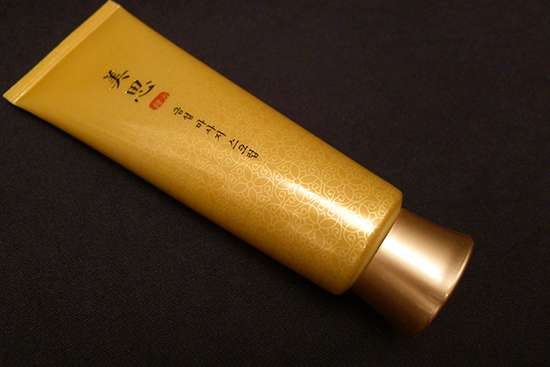 It was with great trepidation that I approached the subject of today’s review, the Missha MISA Geumsul Massage Scrub. I’ve stated a few times in the past that I’m not a huge on physical exfoliators, preferring to exfoliate chemically with a BHA or an AHA instead. My main beef with physical exfoliators is that it’s so easy to overdo it, and the redness, dryness, and breakouts that come with overexfoliation are the pits. Still, physical exfoliators have their place – they’re handy for getting rid of visible flakes, something I’m no stranger to. Even then, I’m very picky about what I use – I generally prefer a konjac sponge, a muslin cloth, or even the occasional sugar scrub. I’m particularly squeamish about physical exfoliators in the form of face scrubs. Many of them use scrubbing agents that are too harsh for most people’s skin – things like ground nut shells or apricot pits. 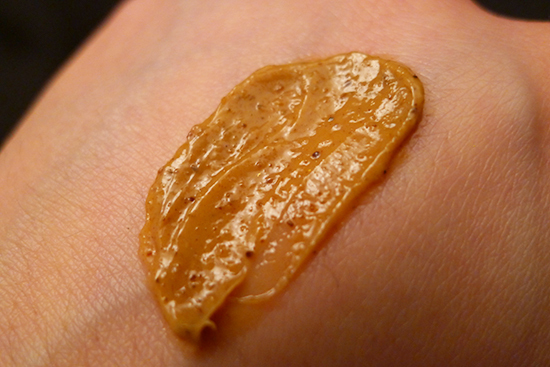 St.Ives Apricot Scrub, for example, uses ground walnut shells. That product suffers all kinds of accusations in the skincare world, the most prevalent being that the hard, jagged edges of the walnut shells can cause microtears in the skin, as well as damage to the skin’s protective acid mantle. I’ve yet to read any studies proving these specific accusations with this product, but I do know that the St.Ives scrub is far too harsh for me, personally. When I do use a face scrub, I generally look for one that uses sugar (it melts) or polished rice (the edges are round). So how did the MISA Geumsul Massage Scrub fare? What sort of scrubbing agent does it use? Most importantly, did it scratch my face off? The Missha MISA Geumsul Massage Scrub ($25) is a cleansing facial scrub, and a part of Missha’s Oriental Medicine-based skincare line (MISA). It promises to gently exfoliate the skin, provide moisture, and balance hydration for a radiant, glowing, complexion. It is said to be suitable for all skin types. Ginseng is a fairly well documented ingredient – there are even some studies that suggest it may have some anticancer properties due to its antioxidant and anti-inflammatory effects. It’s also been shown in at least one in-vitro human study to stimulate collagen production, and has had numerous animal studies showing it to accelerate wound healing, and even reduce wrinkles caused by UV damage. One of my favorite skincare actives – licorice root is anti-inflammatory, anti-viral, anti-bacterial, and has skin brightening properties, making it a wonderful ingredient for acne prone skin and hyperpigmentation. High up on my priority list was figuring out what the scrubbing agent is in this product. The agent, it turns out, is grape seed powder. I’d already used the Missha MISA Geumsul Massage Scrub several times before I figured this out, and formed an opinion about how it feels. More details on that experience in just a minute, but first, let’s talk about grape seed powder as an exfoliant. 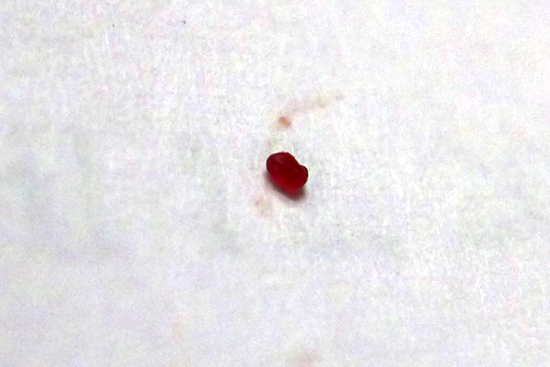 I’ve handled whole grape seeds a few times in my life, but I really didn’t pay attention to how firm they were. Now I suddenly found myself wondering whether powdered grape seed particles were terribly jagged, and also how hard they were compared to something like, say, walnut shell particles. Sadly, none of this information is readily available on the Internet. For the first time since I was 11 years old, I found myself wishing I owned a microscope. I’m a pretty resourceful lady though, so I came up with some alternative ways to examine the properties of grape seed powder particles. I managed to separate one of the larger particles from the product (not an easy task), and took a few close-up snap shots. The particle edges are certainly not what I would call rounded, but they weren’t as sharp as a walnut shell particle’s edge. A very, very, zoomed in shot of one of the scrub particles. If you knew how tiny this thing was, you’d be really impressed with this shot. I then applied pressure to the grape seed powder particle a few different ways. First, I squeezed it between my fingers: no give, and there was no change in the shape of the particle. Secondly, I tried the very clinical method of applying as much pressure as I could with a fingernail. Still no give, and no change to the shape of the particle. 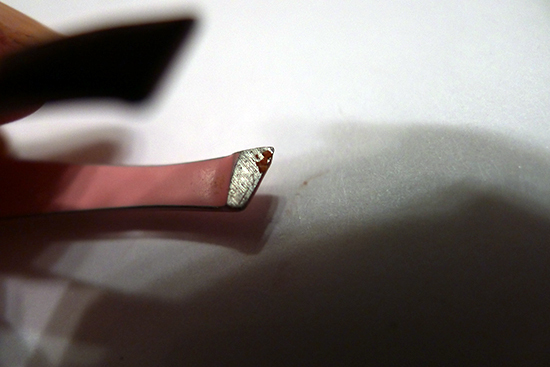 Lastly, I picked it up with my trusty Tweezerman tweezers, and slowly increased the amount of pressure I applied. 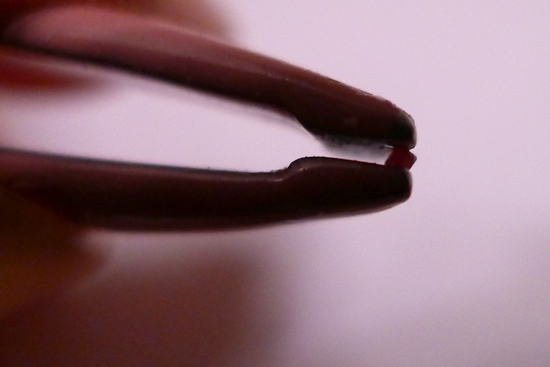 There wasn’t any perceptible give until I was squeezing the tweezers very firmly, and at that point the particle just sort of exploded, leaving only a trace of its former self in the form of a smear on the tip of my tweezers. My very scientific conclusion: grape seed powder particles are firmer than sugar, but neither as hard nor as sharp as walnut shell particles. Case closed? Anyway, as far as CosDNA goes, for having such a long list of ingredients, the Missha MISA Geumsul Massage Scrub has surprisingly few potential irritation or acne triggers. Cetearyl Alcohol weighs in at its usual 4 as a potential acne trigger, and 3 as a potential irritant. 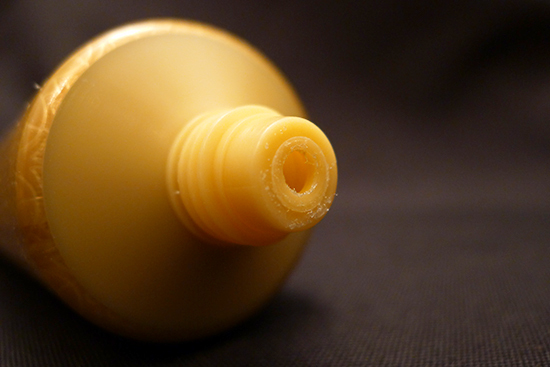 Sodium Lauryl Sulfate makes an appearance toward the end of the list, with a 5 as a potential acne trigger. Missha MISA Geumsul Massage Scrub comes in a tall, plastic, squeeze tube, with a straightforward dispenser in the form of a hole in the tip. 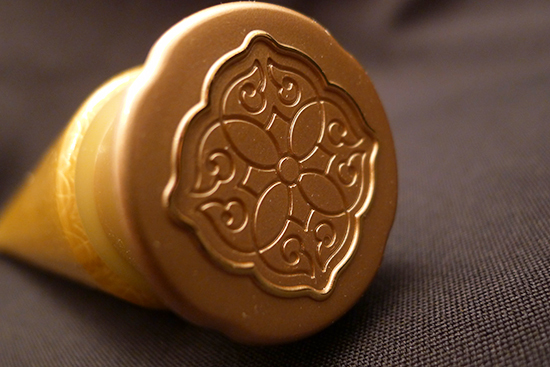 The body of the tube is actually quite beautiful – it’s colored with a gold gradient and a pattern type that I’ll just call, “Asian-style damask.” The cap is made of hard gold plastic, and adorned with the symbol found on the caps of all products in the MISA lineup. The product itself is a creamy coffee color, speckled with dark brown dots (the grape seed powder particles). The MISA Geumsul Massage Scrub smells distinctively herbal, but also a tiny bit like coffee. It was present enough that I briefly wondered if the scrubbing agent in this product was coffee. There is no coffee in this product, so I’m not sure what that’s about. I use this product about three times a week (which is pretty frequent for me as far as physical exfoliators go). When I use it, I use it as my second cleanser after removing my makeup in the evening. I squeeze out a chickpea-sized amount, and gently massage it over my wet face. It gets pretty slippery once it makes contact with water, and glades over my face without any tugging. There aren’t a huge number of scrubbing particles in this formula – I’d say less than half the amount of scrubbing particles you’d normally find in a sugar-based facial scrub. Because of how the particles are dispersed and the amount of slip in the cleanser, it felt very different from other scrubs I’ve used. For example, the individual particles were firm enough that I could feel each and every one of them, and at times they felt scratchy. Not intensely, and not painfully so, but it was a vastly different feeling from a scrub that has a dense amount of a different, softer, scrubbing agent. Also, because the particles were so spread out, I sometimes worried they weren’t covering enough surface area to remove flakes. That particular fear turned out to be unfounded, for what it’s worth. After 30 seconds or so of massaging the product around, I rinse with several splashes of warm water. The cleanser part of the product disappears after the first splash or two, but it takes a few more to ensure all the scrubbing particles are gone. I’ve been using the Missha MISA Geumsul Massage Scrub about three times a week for the past 5 weeks (while skipping all other physical exfoliants). There are some aspects about it I really like – it is very effective for getting rid of any visible dry skin flakes, and my skin does feel exceptionally smooth after each use. Additionally, it cleanses well without leaving my face feeling dry or stripped. I’ve experienced no breakouts or irritation as a result of using this scrub. Although I really like the creaminess of the cleanser component of this product, I’m not a huge fan of the sensation I get from the scrubbing agent. It often feels like it’s too scratchy, while simultaneously not covering enough surface area. The results have been fine so far though. 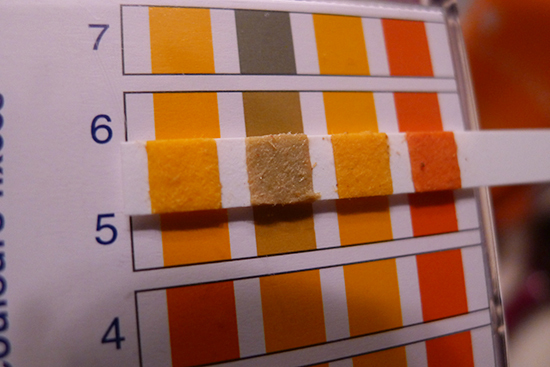 I really like my cleansers to be slightly acidic – in the 5.0-6.5 range. Any higher than that and my face starts feeling tight and dry. The pH for this scrub is pretty great – it comes in right around 6.0. There’s a lot to like about the MISA Geumsul Massage Scrub, but I feel like a different scrubbing ingredient could have made it truly spectacular. 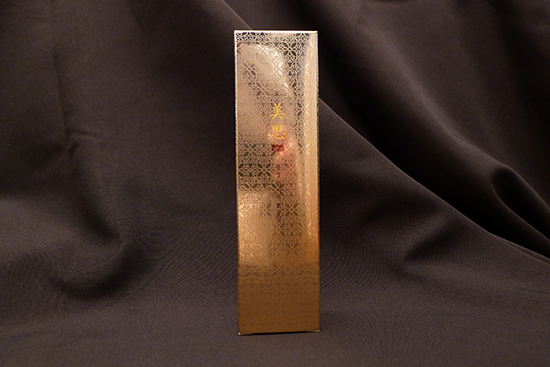 I wish there was a version of this product that used polished rice – I’d buy that in a heartbeat. Missha MISA Geumsul Massage Scrub is available on the US Missha website for $25. W2Beauty carries this product for $29. First time W2Beauty customers can get a $5 W2Beauty voucher by entering my sponsor code at sign-up: 025605. It’s also available from eBay seller Sing Sing Girl for $25. 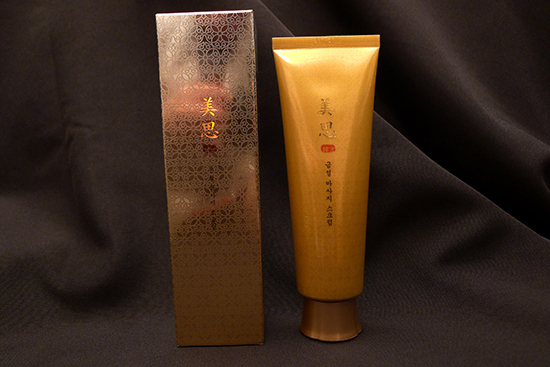 I’d always wanted to try the Missha Sulwhasoo looking line, but just never got around to it. I’m like you, I’ve switched from manual exfoliators to chemical ones (or my trust clarisonic), but now I’m intrigued. I love the color of the actual product. It looks so lush! I’m a big fan of the color too! I really adore your reviews! You even tested the grape seed powder and I ‘m like ”WOW”! Thank you so much for your deep explanation on this product ! I prefer to avoid specific alcohols in my exfoliants, such as denatured alcohol. I do sometimes give products a chance that contain it, but my skin responds best to exfoliants without it – the combination often causes irritation for me. Fatty alcohols are another story entirely – they have totally different properties and do completely different things. Do you know what sort of alcohols are in your new exfoliator? If you liked the texture of the Shea Terra Camel’s Milk but found the lactic acid content to be too much for you, I would recommend the Argan & Desert Date Moisturizer. The texture is very similar, but it doesn’t contain any AHA like the Camel’s Milk cream. The ingredients for the Skin & Lab Exfoliator look really promising. I will have to give that one a try! Thanks for sharing! Wow, what a great reply 🙂 Thank you. I’ll have to check out that Argan & Desert Date Moisturizer… I’m assuming I’m sensitive to the AHA in the Camel’s Milk cream and not the Argan, but perhaps I should verify that I’m not sensitive to Argan first before considering that other moisturizer (can Argan be warming or do you think that’s the sensation that can come with the AHA specifically in the Camel’s Milk cream?) I don’t have much experience with lactic acid products (though perhaps I’m uniquely sensitive to that at certain strengths or something), just salicylic and glycolic acids primarily, which for the most part, I tolerate well as long as I know my frequency and strength limits. I avoid alcohol in salicylic exfoliants, as well as in toners. So as far as the glycolic exfoliant moisturizer I’m newly trying a sample size of… I think it has all exclusively fatty alcohol types (about three kinds)… in trying to find information… I unexpectedly found it on a hair care website from a google search. The one I’m trying is Glycolic Acid 8%, pH 3.9 and I like the sample (0.7 oz) because it was super affordable and there was a promotion for it a while back (I never knew this skin care line ever offered samples before that), but the full-size is a bit pricey/beyond what I normally pay for skincare. Ah, interesting. Yeah, if you typically aren’t sensitive to acids and the sensation was “warming,” it sounds like you’re having a reaction to another one of the ingredients. I’d skip the other Argan & Desert Date cream as well in that case – I have a friend that had a similar reaction, and I strongly suspect it could be a sensitivity to the preservative used (though I can’t be sure – it really is just a guess). 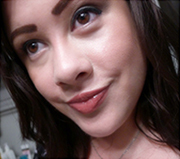 The one other question I meant to ask was… what kind of camera do you have/used for the zoomed in picture? That was quite awesome/impressive to see I must admit!! I really do appreciate the quality of your reviews. You are dedicated, man. I have an idea of how tiny that scrubby particle is and I am indeed impressed. Ha! Thanks, Bethany. By the way, does the font still look crazy on your computer?